There may be days where NQ is the better long/short over YM, but there are never any easy trades. The strong inverse relationship seen between XLF and XLE as of late probably won't last long. Yep, never easy/sure thing....but the SPUD works well. was good for $80 per 1-lot pair in a couple hours time today. I expect to take this off tomorrow morning for > $120 per pair. I like the the SPmini vs YMmini because if you put 11sp/10ym on you have damn near a riskless trade. the 11sp/10ym can't work every time. It's probably been working to the short side as of late, but there will surely be days where the reverse outcome occurs. This isn't really an arb strategy. Each contract has a different profit/tick, and each has a different Average daily range. I'd like to see this strategy work 5 trading days in a row via a trading log. I'm not saying your wrong and that this doesn't work, I'm just questioning the consistency of this being a strategy with a statistical edge. As for my trading logs, I'm not here to prove anything. Only learning, sharing info. I checked out the link.I'm guessing if you bought the spread today you were a winner, because both financials and energy rallied and SP500 has a higher weighting of both of those sectors. Overall, historically it looks like buying the spread is the better bet. I'm very interested in learning more about spread trading. 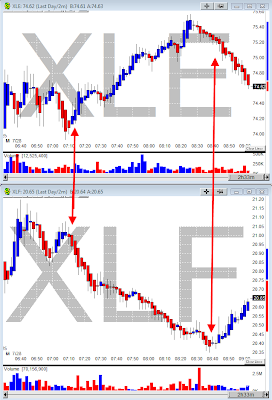 Sometimes I do spread trades, short ER2, long YM, or short ZF and long ZB. The lowered margin requirements is great too if you are on the right side of the ratio. I'm wondering how you know when to buy or sell the spread. Do you use PREM, or do you calculate the ratio with your own software. I am still working on technique, but what I have been doing is looking at pre-market movers to see what sector is powering higher/lower. Then, I'll just trade off a 1-minute comparison chart. The plotted values are /ESx50 compared with /YMx5 (to show the "notional dollar value"). For example, today, I was buying the spread because the SEC/FED is continuing to pimp the financials. Energy was a wild card, but it helped I would imagine. I would buy the spread when the /ES dipped below the /YM on that comparison chart. I made liquidation when they get back to parity or greater (/ES squeezes above). Interesting. Thanks for the reply. I will begin trying out this technique in the simulator account. I have some more research to do on it, and the possibility of making a ratio indicator seems like a fabulous idea. I'm sure this idea is more popular with bond traders that trade the spread, betting the difference between 30yr/10yr and so on. I hope your success continues. It was interesting to note a week or so ago ER2 was up 2.4% while ES was up only 0.8%. Today ER2 was up 0.6% and ES was up 1.67%, so there is definitely some divergences between the indices on any given day. I think making an indicator for ratios between the various indices would give us a significant edge.